The National Rugby League (NRL) is the top competition of professional Rugby league clubs in Australasia. 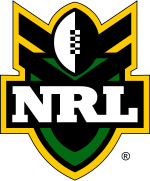 The NRL's main competition (known as the Telstra Premiership due to sponsorship), is contested by sixteen teams, fifteen of which are based in Australia with one based in New Zealand. It is the world's elite rugby league championship and, per season, is the single most viewed and attended Rugby football competition in the world. The National Rugby League is the present-day embodiment of Australia's top-level domestic Rugby league competition, which in turn grew from Sydney's club competition, and which has been running continuously since 1908. The NRL formed in the aftermath of the 1990s' Super League war as a joint partnership between the sport's already-existing national governing body, the Australian Rugby League (ARL) and News Corporation-controlled Super League, after both organisations ran premierships parallel to each other in 1997. NRL matches are played throughout Australia and New Zealand from Autumn until Spring. The season culminates in the premiership deciding game, the NRL Grand Final, traditionally one of Australia's most popular sporting events and one of the largest attended club championship events in the world. In addition, the NRL champions also play a world-series style contest against the premiers of the European Super League competition in the World Club Challenge. Two current NRL teams have existed since the 1908 foundation of the NSWRL, the predecessor of the NRL. These teams are the South Sydney Rabbitohs and the Sydney Roosters (founded as 'Eastern Suburbs'). The Wests Tigers team resulted from a merger between the Western Suburbs Magpies and the Balmain Tigers, both of which were foundation clubs which played in the first grade competition between 1908 and 1999. Despite fielding a join-venture team in the NRL, Western Suburbs and Balmain remain independent clubs and field their own teams in lower-level competitions. The North Sydney Bears were also a foundation club of the NSWRL in 1908, though they are currently playing in the NSW Cup instead of the top level of Rugby League. This was after a failed merger with arch rivals the Manly-Warringah Sea Eagles in 2000 which they ran under the banner of the now defunct Northern Eagles. The North Sydney Bears have proposed readmission to the NRL for the 2013 season which they will be called the Central Coast Bears and play their home games at Gosford where they built their homeground Graham Park. Former top-grade side Newtown Jets were also a foundation club, but were forced out of the competition after the 1983 season for financial reasons. They now field a team in the NSW Cup. There also existed Newcastle (who withdrew after 1909 to start a local premiership) and Glebe (also known as "The Dirty Reds" because their colour was maroon) who were removed from the NSWRL premiership in 1929 for "unsporting behaviour". Twenty three days after the kickoff on 20 April 1908, another team entered from Cumberland. They only ever won one game as they won the wooden spoon in 1908 and did not participate after that.